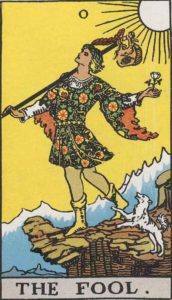 The Fool is one of the most well-known Tarot cards, and part of the Major Arcana set. Much of the Major Arcana is told as ‘The Story of the Fool’. It is an important, and positive card in the Tarot deck. Fool here is used more in an ignorant sense, than that of a stupid person. The Fool simply hasn’t experienced enough. Unlike some other cards, The Fool usually represents the person the reading is aimed at and not somebody in relation to them. We all experience The Fool at some point in our lives, either when we are him, or see others who are. We’ve selected live tarot readers to give you a FREE 3 Minute interpretation of The Fool! Scroll through them below and pick your favorite one. Past – The Fool in the Past position could represent a time in the past where you could have taken another route and ended up somewhere different than where you are now. It could also mean that you have already set things into motion that will produce a new path for the person in question. It can also represent time wasted. Present – The Fool in the present position places the person in the mind of the fool, but in their current position. They could be about to abandon something, or are looking for new horizons and wanting to enter a new phase of life. Generally, you may feel as though are are about to begin a new journey. Future – The Fool in the future position relates to, unsurprisingly, a future journey. Not a literal journey where you pack things up, but a personal and spiritual journey. New goals, desires and attainment of new knowledge await. The Fool is especially good to draw for the future if you are starting a new school, workplace or other activity that will be a big part of your life. Work / Education – The Fool is about new starts, and new fields. This could indicate a change of career, or a new direction to take. The taking up of another interest or drastic new step. Are you thinking of becoming an entrepreneur? There might be a new way to do what you’re doing already. If you’re in school, it could mean a new class, club, or extracurricular activity. Romance – The Fool in romance means that, you may have guessed, a new romantic interest may be dawning. It can also mean that your existing relationship can take an unexpected turn (for the better!). You might know your partner better and get closer to him or her. If you aren’t in a relationship, maybe you aren’t ready for one right now. Friends – The Fool in regards to friendship could mean that you are going to branch out into a new group of friends, or a new clique. The focus with The Fool is new new new! You may make some new friends, or get to know some existing friends better. They might not be the best friends you could ever have, but you’ll find them interesting, and they you. Money – The Fool gives a surprising answer when asked about money. It’s a good sign, like many other meanings of The Fool. It can mean a new job or project will pay off, or at the very least be a positive experience. Health – The Fool is a healthy guy. He’s got a whole journey ahead of him. The Fool is largely positive in relation to health. Nothing is going to get in the way of him and his attainment of knowledge. Don’t even worry about health, if this is the case. Spirituality and Mentality – You just want to get going. In regards to spirituality, you might be looking for the right religious or spiritual system that feels ‘just right’. Don’t worry about it, it’ll come. You can be eclectic, do what you think is best. The Fool is the embodiment of ‘Beginners mind’. When you start a new hobby and think of all the wondrous possibilities because you aren’t hampered down with the nitty-gritty technicalities is the essence of The Fool. The Fool is in search of meaning and experience. He has everything he needs and is just starting out. 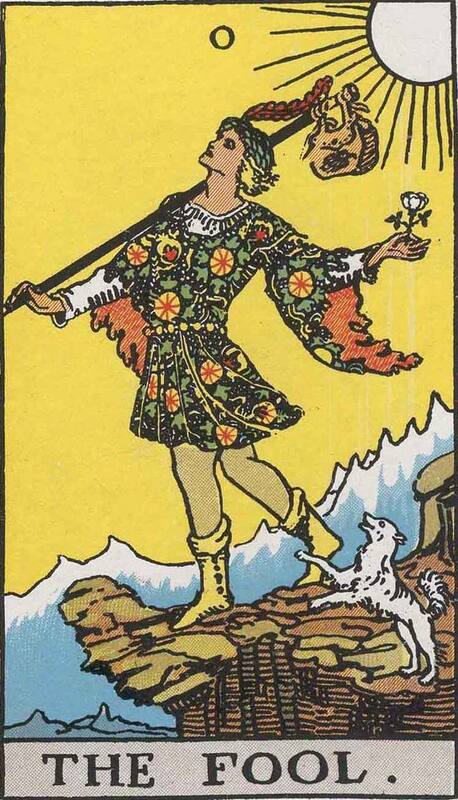 In the Rider Waite deck, the fool is seen carrying a bindle, all his worldly possessions. The number of the Fool is zero. The Journey of the Fool takes him through all the cards of the Major Arcana, which are numbered. Zero plus any number becomes that number, and in the same way, The Fool can become more than himself. Zero however, is a cyclical number. The Fool understands that there is more to life in a different paradigm than he currently experiences. Rose symbology is used in the Rider Waite deck. The white rose in the hand of the fool shows, as white would suggest, purity, freedom. The explosive decal on his clothing represent potentiality. In Reverse, the Fool may lead towards a feeling of being stopped from doing something; for instance a lack of creativity or writers block. It can also hint towards recklessness, and novice behaviour when pursuing a new venture. Be sure that you aren’t getting lost in your own thoughts and not actively ‘doing’. We all have ideas, but it is only through action that these ideas materialise and have value. Misc: Shoshin (初心) is a word from Zen Buddhism. It means a ‘Beginners Mind’, which refers to having an attitude of eagerness and lack of preconceptions when studying a subject, even when studying at an advanced level, just as a beginner would. The Fool is often like this; eager to start and having no debilitating concerns that somebody experienced may have.